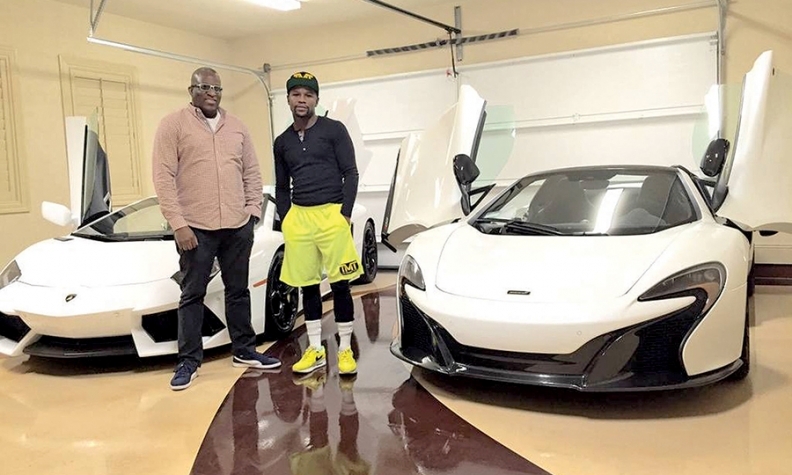 Obi Okeke, left, co-owner of Fusion Luxury Motors, delivered this McLaren 650S to boxer Floyd Mayweather at 3 a.m. The boxer, known for flashing his cash and his extensive exotic-car collection, had a mission for his trusted dealer: Have a Bugatti Veyron sitting in the driveway of his Las Vegas mansion in 12 hours. So Okeke jumped in the shower and headed to Fusion Luxury Motors, the Chatsworth, Calif., company he started in 2012 and co-owns. Fusion offers "customized vehicles sourcing" for its clients. He checked his notes, hopped on a plane, secured the car and drove it to Mayweather himself. That's life when you're dealing with the spontaneous Mayweather, who, according to some reports, stood to rake in up to $180 million from last weekend's bout with fellow superstar Manny Pacquiao. Okeke said there's no room for mediocrity when dealing with Mayweather. The polarizing boxer has high expectations for himself, Okeke said, and therefore does for everyone around him. Okeke has sold 39 cars to Mayweather, including a $3.2 million Ferrari Enzo and three Bugatti Veyrons that are worth $6.2 million combined. In a career spanning nearly 30 years, Okeke has sold cars to the likes of Arnold Schwarzenegger, Jessica Simpson, Ellen DeGeneres, Chris Tucker and more. He started his career at a Chevrolet store in 1987 and eventually moved on to manage Mercedes-Benz, Lexus, BMW, Ferrari and Maserati stores before he started his own. Okeke, 53, spoke with Staff Reporter Vince Bond Jr. about his life and Mayweather adventures. "He will call me in Las Vegas, sitting on his jet about to take off, and tell me he's on his way. It takes him about 45 minutes to get to L.A. from Vegas. I try to give him service that nobody else will provide." 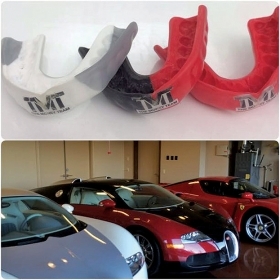 The boxer has mouth guards custom made to match his cars. A: I was not. My father is from Nigeria; my mother is from Ohio. I was born in Nigeria. My parents have been married for 57 years. When I was a kid, Nigeria had a civil war, so we escaped from Nigeria as refugees [to Ohio], just my mom and the kids. Then we went back to Nigeria. My parents weren't crazy about the school system. My mom's best friend was in charge of Swissair for western Africa, so they shipped me off to Switzerland. When did you meet Floyd? Back in 2008, 2009. I was general manager of a Ferrari dealership. A business associate brought him to the Ferrari dealership. I transacted on two Ferraris with him. My parents sent me to school in Switzerland as a young child, so I've always been very close to the European cars. And that's why I was with Volkswagen. I tried to get a job at BMW and Mercedes, but nobody would hire me in L.A., so I just took a job with Lexus. And then from Lexus to BMW, Mercedes, Ferrari, Maserati. How has it changed? I focus a lot more on customer service. My focus is taking care of the client because when you go to a dealership to acquire a car, it's basically they want you in and they want you out. It's a numbers game. I like to focus time on taking care of the clients and spending time with the clients. And trying to do events that may be worth their while, or something that might be engaging to them. That's how I view it. I saw that Floyd called you and said he wanted a Bugatti in 12 hours. That sounds like an impossible task. An Instagram photo shows a small part of the boxer's fleet of vehicles. I was just getting accustomed to receiving calls from him in the middle of the night for the past six weeks. I picked up the call, walked downstairs as I'm talking to him, and he told me he wanted a car in his driveway in 12 hours. I knew where there were a few cars. I said, well, I need to hop on a plane. I think I took a 7:30 flight out in the morning. I went to a destination that was closest to him that I felt I could get the car to him. When I got there, they weren't open yet. So I went to IHOP, got some breakfast, then I went there and said I want to buy this Bugatti. They thought that I wasn't serious. I called my partner, wired the money. Then the problem was trying to get a truck to flatbed it to his home. He will call me on cars that are $500,000 and up. $1 million, $2 million, $3 million, that's when I'll get the call. I sold him a lot of [Rolls-Royces], and I sold him a lot of Bentleys. I don't know if a franchised dealer is willing to do what I do. I don't know if a franchised dealer is going to be able to take the phone calls in the middle of the night. I don't know if they're going to be able to open up their showroom in the middle of the night for him. My rule with Floyd is one hour. Floyd will call me and say, "I'm on my way." He'll call me at midnight, 12:30, 1, 2 in the morning and say, "I'm on my way." That means he's on his way to my dealership. The only thing I ask of him is just give me one hour because I've got to get up and get ready and head to the dealership. My dealership is about 45 minutes from my house. He will call me in Las Vegas, sitting on his jet about to take off, and tell me he's on his way. It takes him about 45 minutes to get to L.A. from Vegas. I try to give him service that nobody else will provide. Do you think he's trying to challenge you? We're in a restaurant at 12:30 at night in Vegas, and we're just sitting there hanging out. He tells the guy to go to my car and get a bag. They get a bag, he goes to the bathroom, he runs out of the bathroom, out of the restaurant and just keeps running! It's his security detail's job to realize he's going jogging [and] to hop in their cars and follow him for 7 miles! It's incredible. I'm at the Wynn resort in Vegas. He calls me at 12:30 [after] midnight, and Vegas is on fire. He says, "Obi, what are you doing?" I say I'm just hanging out. He says, "OK, why don't you come meet me at Fatburger?" I go to Fatburger on the strip, and I hang out with him at Fatburger. From there, we go to his house. We're hanging out at his house. Then these bags start moving around. I said, "Floyd what are we doing?" He said, "Let's go to the gym." At 3:30 in the morning, he starts heading to the gym. He spars for one hour, killing these sparring partners. And then he runs out of the gym and starts running for 7 miles. I have him on video. He doesn't care what time it is. If he feels the need to do what he wants to do to workout and train, he's going to do it. I don't know if he challenges me or if I'm just in this environment of his and this is just how he operates. It keeps me on my toes. It makes me want to work harder. It makes me think out of the box. I push myself harder. I take it all in stride, and I appreciate the opportunity. We think about it; we talk about it. Because of where we are in a very remote area, [Mayweather] drives out to the middle of nowhere to see me. I open up in the middle of the night every time. Seventy percent of our cars go out of state, so yeah, we could definitely operate in a place like Vegas. ... I'm out there five to six times a month right now. Sometimes I'm there three times in a week. 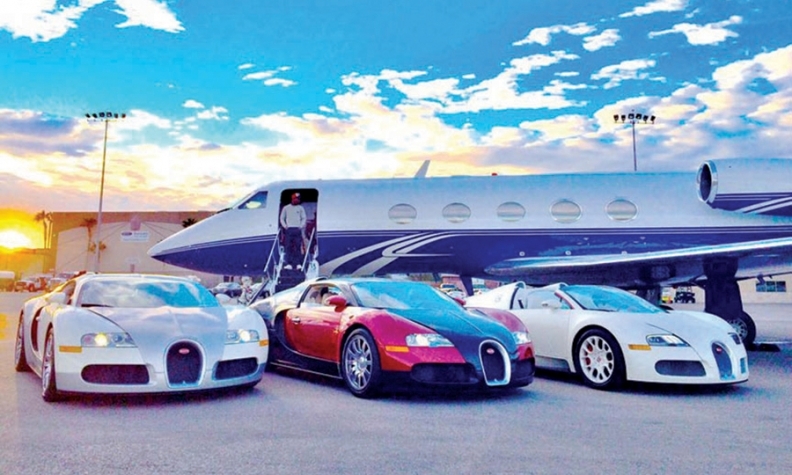 Looking at Mayweather's car collection, do you think that's part of his competitive spirit to have the rarest cars? It's part of his lifestyle. Floyd understands that there are a lot of people that claim to be living a lifestyle they are not living. And he is living that lifestyle. Unlike anybody else, he has no debt. He has no debt on any of his cars and real estate holdings. There are celebrities out there I know, and a lot people know, that finance their cars and lease their cars. All of their Bugattis are financed and leased. He's got three Bugattis that are all cash. Every car in his garage, all cash. The thing about Floyd, he is the only signatory on his account. Nobody manages his money but him. So when I get paid, it's not like we're waiting for the business office. It's all Floyd. He writes the check himself. No. Everybody that I've dealt with, the money was coming from their business office, or [an] agent was going to get the money to me. He is the first celebrity I've met that writes his own check, that manages his own money. I'm not expecting a check from a CPA or an agent or anything. It's from him.